TUCSON, Ariz. (CNS) — For a long time, Father Timothy Martinez felt alone. Not so much in his priesthood and his responsibilities as pastor of Risen Savior Parish in Albuquerque, New Mexico, but because of his passion for astronomy and his concern about the media-driven divide between religion and science. He wondered how the two be could be shown to be complementary and share with his parishioners ways they can appreciate creation by knowing a little more about the universe. Then he attended the Vatican Observatory’s Faith and Astronomy Workshop in 2015 and was back again for this year’s session Jan. 11-15 in the Arizona desert near Tucson with his Celestron 11-inch reflector telescope in tow. Father Martinez is not feeling so alone anymore. The priest was among 14 clergymen (of a total of 25 people in attendance) at this year’s workshop at the Redemptorist Renewal Center. 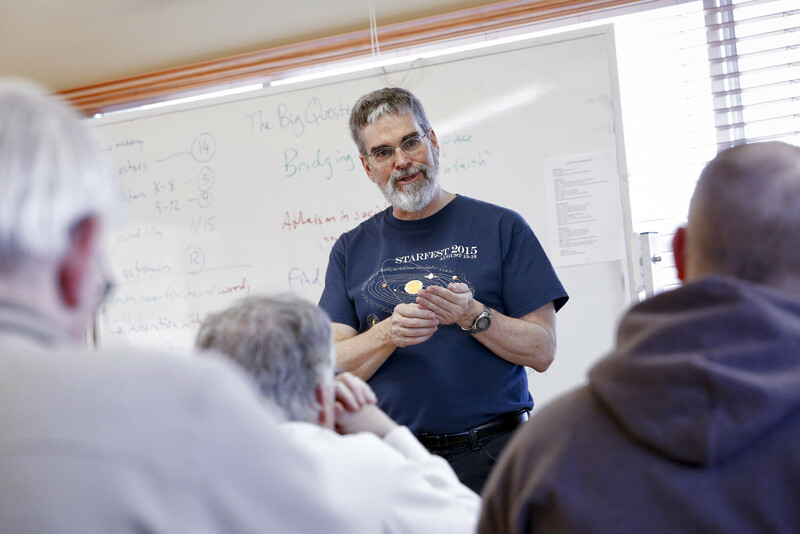 Jesuit Brother Guy Consolmagno, Vatican Observatory director, said the weeklong gathering was designed to help parish leaders, educators and interested laypeople know that there are many like believers and that they can demonstrate in their ministries that faith and science do not have to be at odds. For Father Martinez, 52, studying the heavens and reading up on the latest astronomical discoveries gives meaning to his existence. “Anything we can touch, we can explore isn’t anything less than touching, exploring aspects of God, what God’s up to. It deepens my understanding of what I’m doing in the world,” he told Catholic News Service. “(The universe) is a giant statement of God, of grace, love, God’s unbounded generosity in creation itself. If I’m going to learn about God, then that’s how I’m going to learn,” he added. Like Father Martinez, most of the priests at the workshop have long had an interest in astronomy. For some, their interest dates from childhood when they would look in wonder at the stars. Some had telescopes growing up and have graduated to bigger instruments today. Others were encouraged to pursue studies in the sciences by teachers, parents or other influential adults — some even after they committed to their vocation. In observing the universe, the priests said they have grown in their appreciation and awe of creation. Coming out of the workshop, they said they feel they can more readily address the faith-science gap and hopefully inspire their parishioners. “For me, there’s not just a material appreciation for creation, but a really spiritual appreciation,” said Father James Kurzynski, pastor of St. Joseph Parish in Menomonie, Wisconsin, and a contributor to the Vatican Observatory’s Catholic Astronomer blog. “It’s about seeing the world almost as a bit of an icon and that preferential heart of iconography of spirituality, that if I can look at an icon of Jesus Christ and reverence not as Jesus himself, but as a bridge that bring me closer to Jesus, there’s that iconic nature of creation as well,” he said. Father Tim Nondorf, pastor of St. Clare Parish in Roseville, California, suggested that knowing God better can happen simply by studying creation. The priests are all too aware of the apparent conflicts between faith and science. They say they have experienced the feeling among parishioners that science poses a threat to religion because it discounts faith, and that if people readily accept theories on the birth and evolution of the universe or the rise of life on Earth they are abandoning God. “People don’t want to have their understanding of the Bible challenged by science because they’re afraid of where that might lead,” said Father Bill Menzel, a retired priest of the Diocese of La Crosse, Wisconsin, a workshop attendee. For Father Menzel and the other priests at the workshop, however, there is no conflict. Both faith and science allow people to contemplate the mysteries and uncertainty that surround life, they said, and open ways to encounter God. “Just how far does it (the universe) go, and how old is everything? What do we know and what don’t we know? These mysteries are formative,” said Father Christopher Zerucha, 32, parochial vicar at St. Mary Church in Painesville, Ohio. He explained how he was eager to integrate what he learned into his work across the multicultural parish, particularly among young people. Father Christopher Singer, chancellor of the Diocese of Erie, Pennsylvania, began to understand that studying science and accepting scientific discoveries did not compromise faith values as a student at Gannon University. He recalled professors in his astronomy and physics classes who were deeply spiritual and faithful to God. That realization prompted him to ask deeper questions about God’s purpose for his life while exploring creation and better understand that the theories about the origins of the universe do not conflict with traditional teachings of the Catholic faith. “Our Catholic tradition faith and reason have been partners, cooperators from the very beginning,” he said. The priests exchanged ideas on taking what they experienced at the workshop to their parishes, schools, fellow priests and bishops and even into their local communities. Ideas included Bible studies that incorporate the heavens, presentations at programs such as Theology on Tap, telescope nights on parish grounds and thoughtful homilies that inspire parishioners to expand their views beyond a limited understanding of the world around them. Father Bryan Reif, pastor, and Deacon Robert Schroeder, of St. Antoninus Parish in Cincinnati, have integrated astronomy into parish life, largely through monthly observing nights for parents and students at the parish school. The gatherings began in 2009, the International Year of Astronomy, after the school was one of several recipients of a telescope under a program through a local museum. Deacon Schroeder has found that the nights have opened the door for conversations on faith and science. For Father Reif, studying the heavens allows him to “tap into the gifts of the Holy Spirit” and hopefully inspire parishioners to do the same.